Located behind Standing Rock Cemetery, Standing Rock has been a subject of intense curiosity over the past few centuries, and with its intriguing position in the center of the Cuyahoga River, it’s no wonder Kent is proud of its ancient mystery. 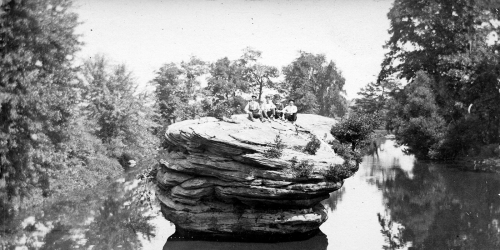 Legend has it that native tribes held council meetings on top of the rock, and in “Recollections of an Old Settler,” by Christian Cackler, Standing Rock marked a key point in the Great Indian trail and served as a communication post between tribes on their journey. Standing Rock has such a rich legacy in Kent that the city was almost named Rockton, but its citizens chose Kent instead. The roaring waters of the Cuyahoga river have always been a focal point to Kent’s history. The Pennsylvania & Ohio canal brought prosperity to Kent.